It is very important to note that the Mountain Districts Association (under the auspices of which the Gasfield Free Mountain Districts efforts runs in the form of a sub-committee) is apolitical. We have no affiliation with any political party. We will not and are not telling anyone who to vote for. That said we recognise that only the government (generally at a state level as far as coal seam gas mining is concerned) controls the licensing of exploration an production licences. Therefore the issue has political implications. We offer the the following simply as an exercise in helping everyone understand where the candidates in the upcoming NSW election stand – all of us choose our candidates come election day based on many factors. For those of you who care about the issue of CSG the following information may help inform your choices. We have asked each of the three major parties (Labor, Liberal and Greens) for statements outlining their position on coal seam gas mining. Both the Labor and Greens candidates standing for election on the Central Coast were happy to meet with us, discuss this issue and work to provide us an official position statement in a timely manner. We thank them for engaging with us. 2. Impose a moratorium across the state and not lift it until the industry is proven to be safe, until we have mapped the aquifers, until we understand the impacts that have been highlighted by Chief Scientist in her report – coal seam gas exploration licenses would be suspended, and new ones will not be issues until the moratorium is lifted. Throughout the latter months of 2014 we attempted to secure a meeting with Liberal member for Gosford Mr. Chris Holstein in order to similarly discuss our concerns and request a position statement (no Liberal party members or candidates in other seats exist nor were announced). Mr. Holstein’s office on several occasions advised that he could not meet us. Via the intervention of a Mountain Districts resident who know’s Mr. Holstein very well and who personally called him last Friday, we met with him Tuesday 5/3/2015. The discussion was respectful and potentially productive and we thank him for meeting us, albeit about four months after we first sought a meeting. 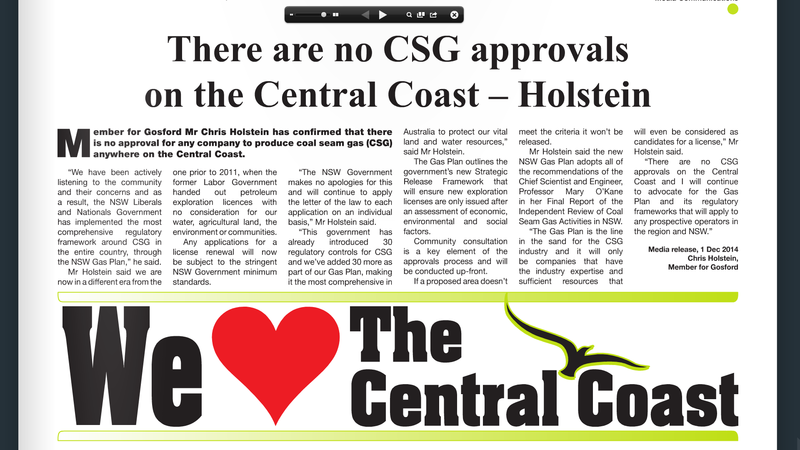 However we do not have a statement from Mr. Holstein nor the Liberal party in general regarding coal seam gas mining on the Central Coast. Therefore all we can provide to try to offer an insight of his views is a press release from Mr. Holstein’s office dated December 1st 2014 and published in the Central Coast Community News December 10th 2014 (edition CCN097). Whoever you vote for on the 28th of March, vote with thought and care. Democracy is a flawed yet precious thing. Over 400 residents of the Mountain Districts and the Central Coast joined together on Saturday the 28th (Feb) to declare the Mountain Districts communities Gasfield Free. SMH journalist and former rugby player Peter FitzSimons and Cr. Greg Best (Wyong) spoke in support of the community’s intent to keep the coal seam gas industry out of the area’s water catchment and aquifers. During the event, held at Neills Park in Kulnura, declaration documents were handed through the assembled crowd until they reached community elders Ed Morris and Betty Bromfield, before being then handed to youth ambassadors Leilani Healey and Jake Bright. The Declaration ceremony reiterates the united will of the community against coal seam gas, after a house-to-house survey conducted during 2014 found that 98.2% of the area’s residents oppose coal seam gas activity. Recently both Wyong and Gosford councils unanimously passed twinned resolutions reaffirming the respective council’s stance against coal seam gas, and standing in support of the Mountain Districts’ residents. Attached here are John’s presentation slideset and associated talking points (both PDF files). See you on the 28th! Our community Gasfield Free Declaration is just around the corner on February 28th. For full event details please see our facebook page. We’ll be kicking off at 4pm, with music, food, a few short (very few, very short) speeches, more food, more music, and all wrapping up at 9pm. There’ll be parking available on Neills Park, next to Kulnura Memorial Hall. For anyone coming from out of town you’re heading for the “Corner George Downes Drive and Greta Road”. 4 weeks to go to our Community Declaration! If you love our district landscape of forests, farms and spring fed streams please stand up and be counted. If Coal Seam Gas miners take up their licence to mine here they will, potentially, devastate the landscape and farms and pollute the underground water. There is plenty of evidence, in other places in Australia, that this will be our fate. Legally we have very few ways to protect the district, but an extremely potent way we can resist the miners coming is by community action to Declare the whole district “Gasfield Free”. 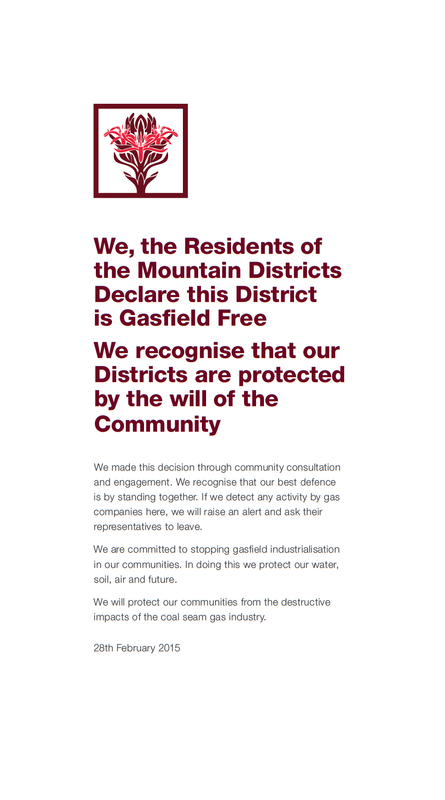 We are organising a district wide Declaration and Celebration, on the afternoon of Saturday February 28th, to tell the many invited politicians, media and local VIP’s that the community has Declared the Mountain Districts Gasfield Free. This will make it very clear to them that we want the Petroleum Exploration Licence that covers the district removed for ever. Your presence at the Declaration is very important because a huge crowd of locals will be very convincing. It will also be fun. We will have live music, food stalls, entertainment for the kids and a Declaration ceremony involving some of our young and older community members. We need volunteers for setting up, food stalls and for the Declaration. Please message us if you would like to volunteer. Please stand up for the community and come to the Declaration. Save the date! 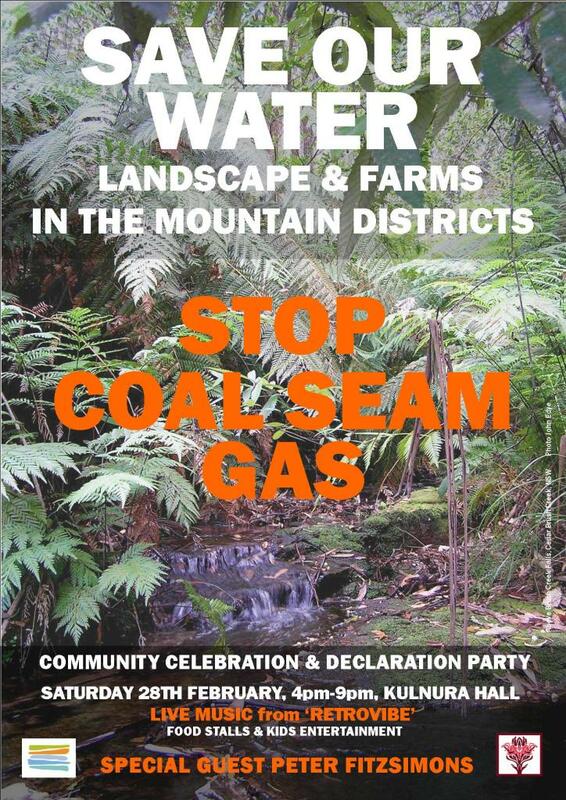 The next step in our process to keep the coal seam gas miners off the Mountain will take place on Saturday the 28th of February, and WE NEED YOU to come along and have some fun (not too much to ask). On the back of the road survey conducted last year we will be holding a Gasfield Free Mountain District Declaration to celebrate our community achievements so far, and also make clear our intentions to local political candidates (in the lead up to the NSW election, the media and so on). This is a really important event and it is also really important that we have a huge show of community support and involvement to demonstrate the united nature of the community’s opposition to coal seam gas. Local politicians and candidates will be invited, so you can have a chance too to sound them out in person about their stance on CSG mining on the Mountain. But its not all work, we also have music, food and some fun for the kids of the Mountain District planned too – more details to come soon. 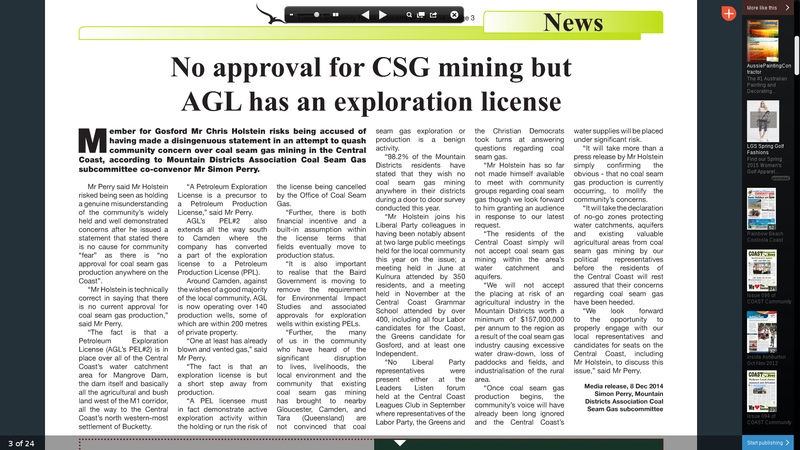 The Dec 5th Central Coast Express Advocate carried a small item on page 5 reporting on a statement from Member for Gosford Mr. Chris Holstein (Lib) to the effect that community concerns over CSG mining were completely misplaced. If you missed it, it is reproduced here. Member for Gosford Mr. Chris Holstein is absolutely correct in saying that there is no current approval for coal seam gas production anywhere in the Central Coast. In saying so however Mr. Holstein risks being accused of having made a disingenuous statement at worst, or at best as holding a genuine misunderstanding of the community’s widely held and well demonstrated concerns. The fact is that a Petroleum Exploration License (AGL’s PEL#2) is in place over all of the Central Coast’s water catchment area for Mangrove Dam, the dam itself and basically all the land West of the M1 corridor all the way to the Central Coast’s North Western-most settlement of Bucketty. A Petroleum Exploration License is a precursor to a Petroleum Production License. AGL’s PEL#2 also extends all the way South to Camden where the company has converted a part of the exploration license to a Petroleum Production License (PPL). Around Camden, against the wishes of a good majority of the local community AGL is now operating over 140 production wells. Some wells are within 200 metres of private property. One at least has already blown and vented gas. The fact is that an exploration license is but a short step away from production. A PEL licensee must in fact demonstrate active exploration activity within the holding or run the risk of of the license being cancelled by the Office of Coal Seam Gas. Further, there is both financial incentive and a built in assumption within the license terms that fields eventually move to production status. It is also important to realise that the Baird Government is also moving to remove the requirement for Environmental Impact Studies and associated approvals for exploration wells within existing PELs. Further, the many of us in the community who have heard of the disruption to lives, livelihoods, the local environment and the community that existing coal seam gas mining has brought to nearby Gloucester, Camden, and Tara (Qld) are not convinced that coal seam gas exploration or production is a benign activity. 98.2% of the Mountain Districts residents have stated that they wish no coal seam gas mining anywhere in their districts during a door to door survey conducted this year. Mr. Holstein joins his Liberal Party colleagues in having been notably absent at two large public meetings held for the local community this year on the issue; a meeting held in June at Kulnura attended by 350 residents, and a meeting held in November at the Central Coast Grammar School attended by over 400 including all four Labor candidates for the Coast, the Green’s candidate for Gosford, and at least one Independent. No Liberal party representatives were present either at the “Leaders Listen” forum held at the Central Coast Leagues Club in September where representatives of the Labor Party, the Greens and the Christian Democrats took turns at answering questions regarding CSG. Mr. Holstein has so far not made himself available to meet with community groups regarding coal seam gas though we look forward to him granting an audience in response to our latest request. The residents of the Central Coast simply will not accept coal seam gas mining within the area’s water catchment and aquifers. We will not accept the placing at risk of an agricultural industry in the Mountain Districts worth a minimum of $157,000,000 p/a to the region as a result of the CSG industry causing excessive water draw-down, loss of paddocks and fields, and industrialisation of the rural area. Once coal seam gas production begins the community’s voice will have already been long ignored and the Central Coast’s water supplies will be placed under significant risk. It will take more than a press release by Mr. Holstein simply confirming the obvious – that no CSG production is currently occurring to mollify the community’s concerns. It will take the declaration of no-go zones protecting water catchments, aquifers and existing valuable agricultural areas from coal seam gas mining by our political representatives before the residents of the Central Coast will rest assured that their concerns regarding coal seam gas have been heeded. We look forward to the opportunity to properly engage with our local representatives and candidates for seats on the Central Coast, including Mr. Chris Holstein to discuss this issue. 1. Heed the stated desire of the community regarding CSG mining and declare the area’s water catchments and aquifers no-go zones for CSG exploration and mining. We request that both Mr. Holstein as local member and also the NSW Liberal Party at large support the local community in this regard. 2. Meet with members of the Mountain Districts Association to discuss in detail the community’s concerns regarding CSG. As the letter has been submitted on behalf of the community we feel it is important that a copy of the submission is openly published for your review. For a copy (PDF) of the letter click Here. "I support the Mountain Districts Association in their battle to allow the residents to decide their own economic future and to protect the homes, land and water of the Mountain Districts from the destructive impacts of the coal and coal seam gas industries. Keep me informed via email and let me know how I can help." Hawkesbury Environment Network A strong, viable, dynamic and credible voice for the environment of the Hawkesbury; a network which is representative of the Hawkesbury communities, which represents its members, and educates and engages the community. Lock The Gate Alliance Lock The Gate Alliance is a national coalition of people from across Australia who are uniting to protect our common heritage – our land, water and communities – from unsafe or inappropriate mining for coal seam gas and other fossil fuels. The Australia Institute Australia’s most influential progressive think tank; it conducts research on a broad range of economic, social and environmental issues in order to inform public debate and bring greater accountability to the democratic process.